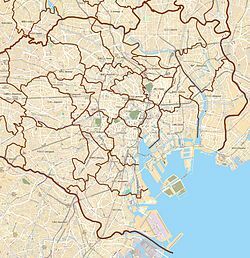 Yumenoshima (夢の島) is a district in Kōtō, Tokyo, Japan, consisting of an artificial island built using waste landfill. It is not the first such island in the bay (See Umi-no-mori ja:海の森公園), however at current fill rates there will be no more room for waste landfill in the bay without affecting shipping lanes by around 2050, likewise Osaka Bay and Ise Bay also are slowing being consumed by waste landfill islands, e.g. Rinku Town. The island was originally conceived in the 1930s as a site for a new Tokyo Municipal Airport to replace Haneda Airport. The airport plan was finalized in 1938 and work on the island began in 1939, but fell behind schedule due to resource constraints during World War II. The airport plan was officially abandoned following the war, as the Allied occupation authorities favored expanding Haneda rather than building a new airport. A public beach opened on the island in 1947, at which time the "Yumenoshima" name was adopted. The beach closed in 1950, and from 1957 the island was used for garbage disposal. Today, Yumenoshima also houses the Daigo Fukuryū Maru, a wooden fishing boat exposed to nuclear fallout during the Bikini Atoll test in 1954; the boat was modified as a training vessel following the exposure, and later abandoned near Yumenoshima. Yumenoshima is set to be the venue for archery events in the 2020 Tokyo Olympics. It will also host archery for the 2020 Paralympics. The qualification field was completed in February 2019. A test event for the Olympic and Paralympic Games archery events will be held in July 2019. ^ "平成22年 東京都区市町村町丁別報告". Retrieved 29 August 2015. ^ a b "東京・夢の島、名前の由来は海水浴場　空港計画も". Nikkei Shimbun. 15 November 2013. Retrieved 15 November 2013. ^ "夢の島公園について" [Yumenoshima Park]. Retrieved 19 September 2015. ^ "Shin-Koto Incineration Plant". Clean Authority of Tokyo 23 cities General Affairs Department General Affairs Division. 18 September 2015. Retrieved 30 September 2015. ^ "Yumenoshima Park" (PDF). Tokyo Metropolitan Government. Retrieved 18 November 2013. ^ "オリンピック・パラリンピック競技場マップ" (PDF). Retrieved 19 September 2015. This page was last edited on 5 March 2019, at 14:14 (UTC).